The 22nd Edition of the Great Pancake Race! 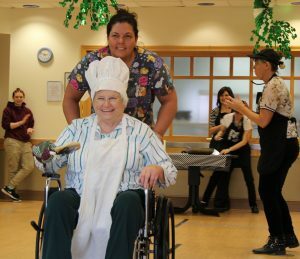 For the 22nd time, LindenGrove residents at our Mukwonago campus competed for the coveted Pancake Race title. The event began in 1996 when Melody Erd, a beloved activities therapist on the campus, came up with the creative idea. Melody retired in 2014, but staff members and residents continue to honor her by keeping up the tradition. The race is a highlight leading up to the Lenten season. Three campus teams – assisted living, memory care and skilled nursing – compete in a relay race against each other for the coveted title. The rules are simple. Each participating resident and teammate must dress the part of a pancake flipper. Meaning before the real action can begin, the competitor must be dressed in a chef hat, apron and oven mitt. The participant uses a spatula to pick up a pre-cooked pancake and the teammate pushes the wheelchair to the other side of the activity room. From there, the pancake is dropped into a frying pan and the two return to the starting line. An approved wheelchair is required for this event, whether the competitor regularly uses one or not. An official timekeeper keeps track of each team’s total time throughout the race. 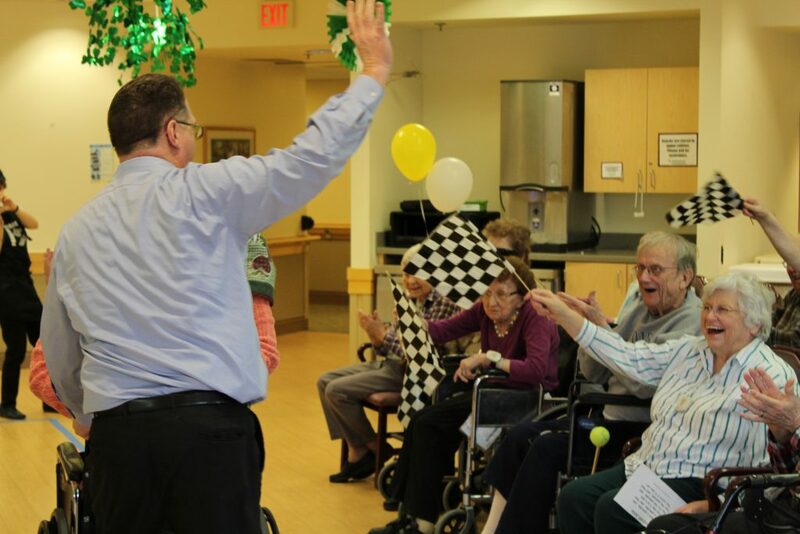 For the third year in a row, the skilled nursing team took the gold, narrowly beating out the memory care and assisted living teams in a spirited finish. The LindenGrove race was born with centuries of history behind it. The day before the beginning of Lent has long been known as Pancake Day in England. Lenten rules once prohibited the eating of dairy products. To use up their dairy supplies of eggs, milk and butter, households would make vast amounts of pancakes to eat. The tradition continues today. Residents cheer on competitors of the 22nd annual Pancake Race at LindenGrove Mukwonago.